Mom sent me this new recipe a week or so ago. It was a huge hit for her, my dad, and sis. Obviously the hubs and I have to try it out now. So simple. I had a lot of these ingredients already in the kitchen. Check it out! Sprinkle 1/2 cup of Stove Top evenly over bottom of 13 x 9 pan. Set aside. Add hot water to remaining Stove Top. Stir and set aside. 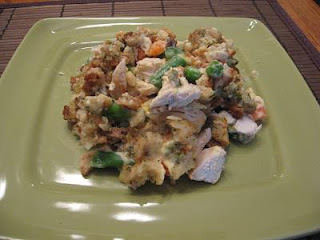 Place chicken over dry stuffing. Mix soup, sour cream and mixed vegetables and spoon over chicken. Top with prepared stuffing. Bake 30 minutes or until cooked. If breakfast is your favorite meal of the day or you're looking for some fabulous breakfast dishes, check out my friend, Scot's blog. He's currently serving up these fabulous dishes at the Pomegranate Inn of Portland, Maine. So if you're ever in the area, stop in, say hello, and enjoy a fab breakfast! Much love, my friend. Much love. No recipe to share today, I apologize (I'm working on some new ones for the next couple of weeks, though), but I had to share this new show on Lifetime called "Cook Yourself Thin." I LOVE it. It's all about taking your regular favorite dishes and using alternatives to cut the calorie count and fat content in the foods we so often crave. I've been astounded by how much they can literally cut out in almost all the meals shared, without sacrificing the taste. If you haven't checked it out yet, do yourself a favor and catch an episode or two. Perhaps you'll be just as hooked as I am! I have a whole list of recipes I'm going to try after seeing them on episodes.